Stephen Build Kodi Install Guide will show you how to install the various Stephen Builds for Kodi. There are some really cool interfaces for Kodi, and many of them are found in the Stephen Builds. Stardust, Black Glass, and many other cool interfaces are at your fingertips and less than ten minutes and a simple install process away. So get out of that boring, old interface you’re used to and into a Stephen Build! 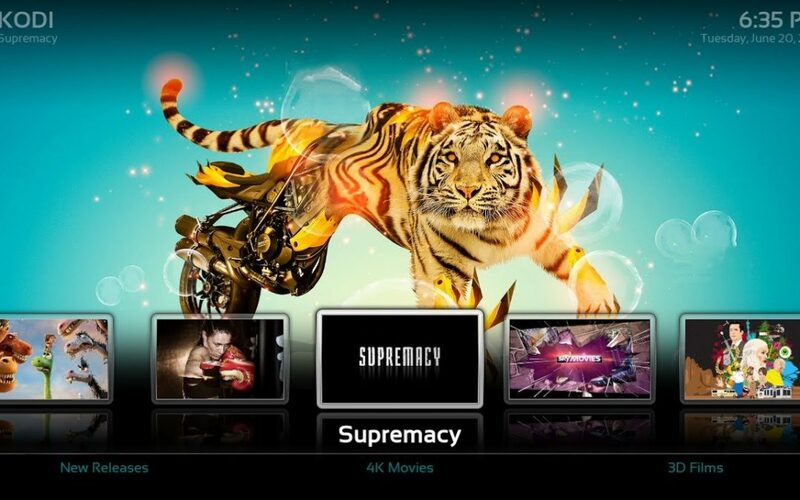 The regular Kodi interface is a basic platform designed to let you access the various add-ons that you want, but you’ve got to do all the legwork and get the add-ons first! It’s also–let’s face it–just not that cool-looking, because it’s simply a framework. A build, on the other hand, comes with a lot of add-ons pre-installed, so that once you install it–BAM!–you’re good-to-go! Builds can also contain beautiful wallpaper artwork and impressive graphical menus to make the experience of using the platform itself more pleasant. So what are you waiting for? Let’s get a cool build! Before you get started, consider installing a Virtual Private Network (VPN) to secure your network and private information. Among other benefits, it can thwart hackers–and even your internet provider–from stealing and distributing your sensitive data. This includes your browsing history. Don’t be a victim of internet identity theft: install a VPN yesterday. Select the . (gear) icon near the top-left. Find the setting “Enable Unknown Sources” and toggle it (to allow Kodi to use Unknown Sources). Using the back-button, get back to the Home screen (you may have to press “back” a couple times). Select the (gear) icon near the top-left. Select File Manager from the main window. In the top dialogue box, enter “http://www.stephen-builds.uk/zip/” and click OK. In the bottom dialogue box, name the source “Stephen” for ease of access later. Using the back-button, get back to the Home screen. Select Add-On Browser in the main window. Now select Install from zip file. A window entitled “Install from zip file” will open. Select Stephen from the items in the window. Wait for the “Add-On Enabled” window to appear; it may take a few minutes. Once the add-on is enabled, then using the back-button, get back to the Home screen. From the Kodi home screen, select Program Add-Ons. Select Stephen Wizard, then Stephen Install. Select which build you’d like to install. We went with the Supremacy Black build, but Meltdown and Stardust are also very cool! Try them out and see which you like. It will ask if you’d like a “Fresh Install” or “Standard Install”; select Fresh Install. It will then ask, “Do you wish to restore your Kodi configuration to default settings”; select Continue. Wait for it to download completely–which may take several minutes–then exit out of Kodi completely. Restart Kodi but WAIT! The new build will still take a few minutes to acquire the necessary add-ons, etc., so give it a few to get ready for first run. Voila! You have a shiny, new Stephen Build! Take a look around and enjoy all the cool features, and if you don’t like this one, install a different one! Regardless of which build you settle on, don’t forget to take a look at installing a VPN to protect your internet security. While you may think you’re safe to stream anything without worry, your sensitive, private data could be at risk! Your browsing data–including this installation of a Stephen Build–is at risk. Not only can hackers steal it, but even your internet service provider can legally sell it! Don’t become a victim of internet identity theft: consider using a VPN, which masks your region, IP address, and pretty much all other sensitive, private information. Now that you’ve completed the Stephen Build Kodi Installation Guide, protect your browsing data, mask your location, and create another, important barrier to hackers: Get your VPN here; it’s easy and quick and makes all the difference to your internet security.